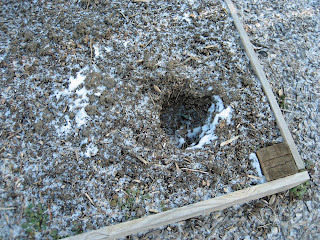 Who dug this hole in one of my raised beds in the vegetable garden? Who? It was not me. I was very careful and deliberate last fall in raking all the beds smooth, and would have noticed if I had dug a hole like this one. I would guess it is almost 8 inches deep. Was it a rabbit? A raccoon? Just who or what thinks they can just go and dig holes in my garden!!?? My Garden! And why is my garden still frozen solid? It is March now, for crying out loud. Winter be gone! By the way, I just noticed that the picture of the hole also shows you how I use a 6" section of a 4x4 post to fasten together the sides of my raised beds at the corners. I have found this method creates a much sturdier corner than trying to fasten the boards directly to each other so I think it is worth the extra effort and cost in the long run to use this method. Plus, if you want to get all fancy in the garden, you can add a decorative wood finial to each corner. I did that in my center bed, just to make it a little different. And I am all calmed down now about the hole. I have a plan. I am going to go out there a bit later and throw some frozen compost on top of it to see if whoever or whatever dug it in the first place would dare to try to dig it again. Oh I hope there is no more digging! I'm ready for winter to leave us, too. I like the use of the 4x4. I usually have used a metal bracket to hold the corner together, but your way looks nicer. So....how far down do you sink the posts? We are thinking about making some raised beds this year. The hole looks like something a dog would dig,but it could be anything.The post in the corners like you say is much better than just fastening the boards together. 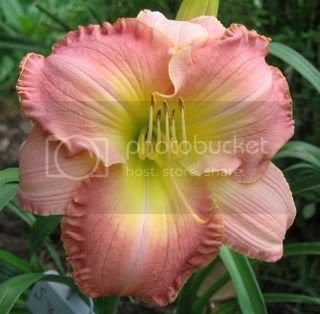 I am so ready to get out in the garden,but old man winter is really hanging on here in indy. At least you can see your hole so you won't step in it. Of course, if a critter dug your hole, no telling how many you may have, so watch your step. Maybe it was some poor cold rabbit trying to find a warm home and dug a hole in your garden. I know I have some in my yard because I saw the tracks in the snow and Daisy goes crazy when I let her out sometimes. This is just my second year of growing my own, previously, always bought from Garden Centers. I've been keeping a diary but have decided this year to have a blog. 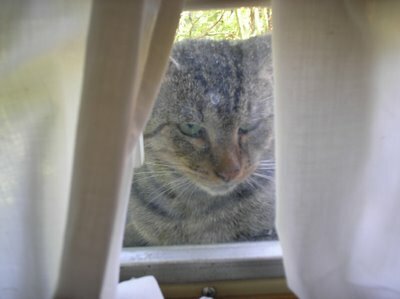 Came on line to check out Garden blogs to see what they're like and came across yours. Really enjoyed it and will be returning. Really enjoyed your blog and seeing whats happening over the pond. Really jealous of your trug have been after one for years must invest in one this year. Hope you have a good growing season this year. Oh, I don't like to see holes! In my case, they're usually vole holes (terrible!). I do feel for you. I do the corners of my raised beds just the same way. Cool. Validation. As it was Green Thumb Sunday I couldn't help but have a mental image of someone sticking an enormous green thumb into the soil to make that hole. Eeek! Green Thumb Monsters ... even worse than garden faeries. All... thanks for the comments. I covered over the hole late yesterday but have not had a chance to check to see if has been redug... stay tuned! MSS... I feel validated that your raised beds are built like mine! Sister with the Homestead... the posts aren't in the ground at all, the frame for the bed just sits on the soil. Gary... a webcame, why didn't I think of that!